Bagels play an integral part in the Trinity Sunday ritual. Students wake up somewhere in between breakfast and lunch, and a bagel sandwich is the logical way out of limbo. Goldberg’s is usually the perfect fix for Sunday morning, but this week I ventured off campus to try Lox, Stock & Bagels in West Hartford. Situated in Bishop’s Corner right next to Five Guys and Whole Foods, Lox, Stock & Bagels is a no-frills shop serving breakfast and sandwiches. The interior is very simple and resembles a typical deli, with tables and chairs, a large sandwich counter, and an expansive menu board behind the counter. In terms of overall cleanliness, the restaurant could have been a bit tidier; many of the tables and chairs were covered in seeds and crumbs. You order at a long counter and the employees prepare your bagel or sandwich, and from there you funnel into the line for the register. Between the sandwich counter and the cash register are baskets filled with a variety of freshly baked goods. Once you get to the register you can order coffee and other drinks. Overall, the ordering process was a bit disorganized but still functional and efficient. The menu features a wide variety of bagels, sandwiches, wraps, and baked goods. Bagel flavors range from plain to French toast. There are many different types of cream cheeses to complement the bagel selection. Choices include jalapeño, lox, strawberry, veggie, scallion, and many more. Some of the bagel sandwiches include sliced Nova Scotia lox, various cold cuts, and your choice of meat. There are also ciabatta sandwiches and wraps, including a Rueben sandwich and chicken Caesar salad wrap. Cinnamon buns, muffins, coffee cake, cookies, and brownies are also available. I ordered a bacon, egg, and cheese sandwich on a sesame bagel and a medium iced coffee. In comparison to the sandwiches at Goldberg’s, the Lox, Stock & Bagels’ version was lighter and less chewy but the bacon was not as crisp. In addition, the Goldberg’s version definitely contains more egg. Goldberg’s has a leg up in overall bacon, egg, and cheese sandwich quality. However, the coffee was great quality. It was strong and not watered down by the ice, which is often the case with iced coffee. Prices were modest, the bacon, egg, and cheese runs at about $4, and the iced coffee about $2.50. Bagels with cream cheese are priced between $2 and $3, depending on the type of cream cheese. The portions of the bagel sandwich could have been a bit larger, as I left still feeling a bit hungry. Next time I would probably add a muffin or cinnamon bun to my order. Overall, the experience at Lox, Stock & Bagels was positive. The bagel sandwich was definitely a good value and well made. 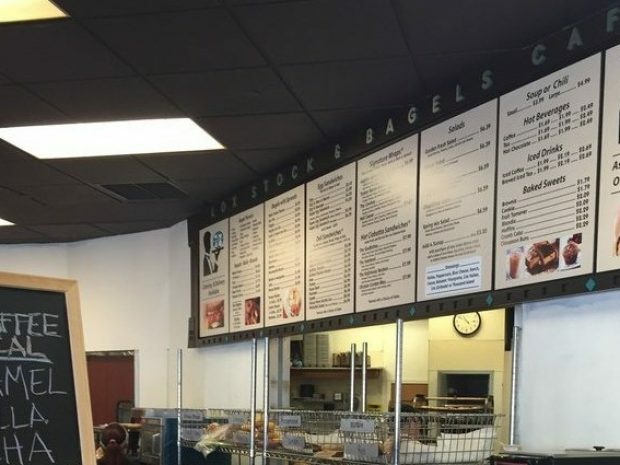 If you are out in West Hartford or really looking for a change of pace in breakfast sandwiches, Lox, Stock & Bagels is a delicious choice. However, given how convenient and high quality Goldberg’s On Campus is, the argument for making a special trip to Lox, Stock & Bagels is hard to make. It is definitely a good spot if you are in the area and looking for a quick breakfast or lunch, but Goldberg’s offers higher quality options with much more convenience.